You may be wondering why it says "No records matched your request" when you haven't even really made a request. This is because the 'default' request that is performed if no other request is specified is to show the first record from the first table in the navigation menu. Since there are no records, it is true that there are NO records matching the default request. List - Shows the records in the current "found set" as a list. (in a table). Find - Allows users to find records matching certain criteria. Throughout this tutorial you will see the phrase "found set" an awful lot, so it is important to understand just what this means. A "found set" is the set of all records in the current table that match the current "find criteria". This begs the question, "what is 'find criteria'?". By default there is no find criteria. When you perform a search or a find on the current table, you add "find criteria" so that only the records satisfying these criteria will be included in the "found set". If you type in "English" in the "Subject" field and click "Find", then the "found set" will consist of only records that contain the word "English" in their subject fields. This indicates that there are 256 records in the current table (which is the 'Groups' table). There are currently only 225 records in the current "found set" (meaning that we have performed a "find" operation and it matched 225 of the records). It also indicates that the currently displayed record is record number 1 out of the 225 found records. Just below the view tabs ('details', 'list', and 'find') there are a few buttons that allow you to perform actions such as create new records, clear find parameters (i.e. Show All), and delete records. new record - Creates a new record in the current table. show all - Clears all find criteria on current table so that all records are shown. delete - Deletes the current record in the table. delete found records - Deletes all records in the current "found set". If no find criteria is specified this will delete all records in the table. 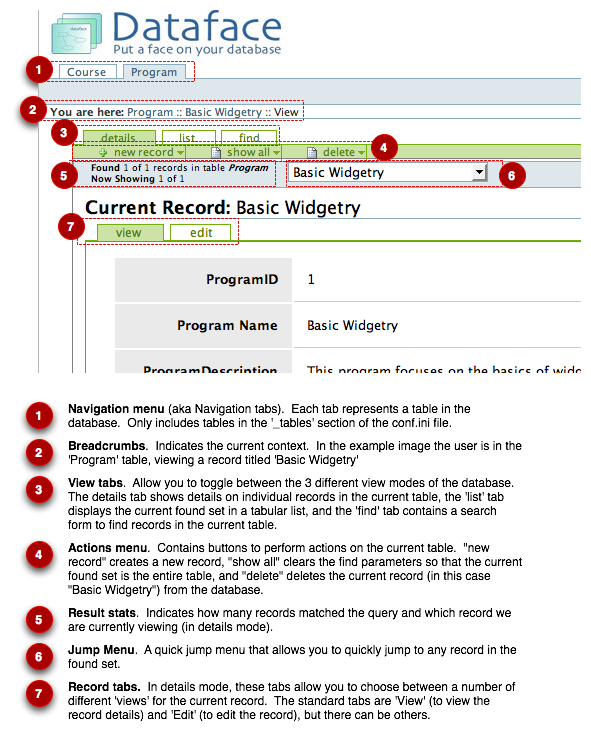 The basic FacultyOfWidgetry application that we created in the previous section isn't very interesting when it doesn't contain any records, so let's create some Program records. Select the "Program" table by clicking on the "Program" option of the navigation menu. Click "new record" in the actions menu (top left). The "details" view allows you to view details or edit the current record. There should be at least 2 sub-tabs: 'View' and 'Edit'. If you click on the 'Edit' tab, you will be presented with a form to edit the record. The form is identical to the "create new record" form. If the 'list' tab is selected, then you will see a button called 'delete found records' in the actions menu (just below the view tabs). Alternatively if the 'details' tab is selected, you will see a button called simply 'delete'. Select "delete" to delete only the current record you are viewing in the "details" view. Select "delete found records" to delete all of the records in the current found set. In either case, you will be prompted to confirm your decision before the records are actually deleted. This short section is only intended to get you acquainted with the basics of Xataface applications. As your application becomes more complex with relationships and value-lists, there will be other usage scenarios of interest.